This is one of those recipes I know for sure I’ll be making over and over again and if you try it, you will get to know why. It is absolutely exquisite! I don’t know if you have seen the Spaghetti Alla Carbonara recipe I posted recently, but it is one of my favorite pasta recipes since I began to prepare it as my mother in law does (see the recipe here). I have seen numerous versions of the “original” Carbonara recipe that are really similar but, the taste is completely different. I prepared some of those recipes before I met my mother in law, but trust me, no recipe was like hers. 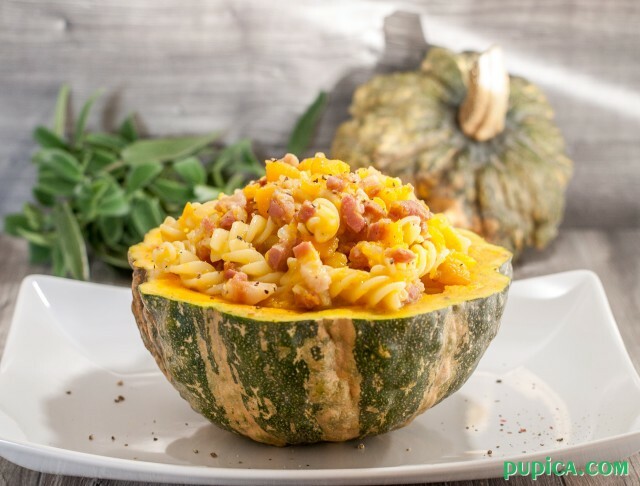 It is a so creamy recipe and packed with flavor that if you try it you will never, ever prepare it any other way and this Pumpkin Carbonara recipe is even more creamy. Is there anyone out there who doesn’t like creamy recipes?! When I came to Italy I discovered this amazing ingredient, the pumpkin! I never prepared any recipe with pumpkin, just because it is an ingredient that is not so popular in the part of the country where I grew up. The first recipe I tried was a pumpkin risotto and till then it was the creamiest meal without the help of cooking cream I’ve ever tried. So I decided to experiment a bit with this exquisite ingredient and I mixed it into some already famous Italian recipes, like the legendary Carbonara recipe. It is practically like the Carbonara recipe that my mother in law prepares, I just added the pumpkin! Wow! The big bang of flavor!!! 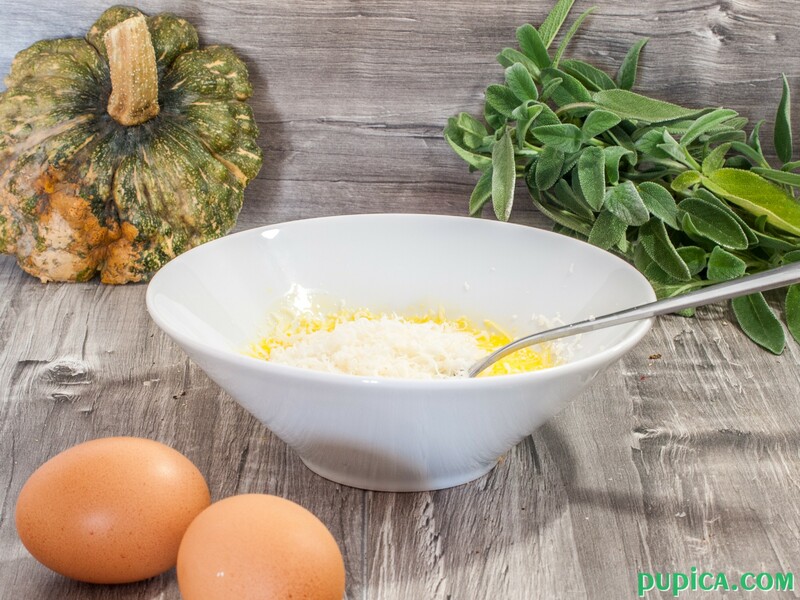 The secret of this recipe is to add the beaten eggs mixed with cheese to the pumpkin sauce which you already removed from the heat and then you add the pasta. Just as in the Spaghetti Alla Carbonara recipe that I wrote, the secret of it being so creamy, even if you don’t add the cooking cream, is that you beat the eggs with the cheese in a bowl and then you add the spaghetti and toss well to coat without cooking further. Although I almost always add a bit of a cooking cream, because I love saucy recipes! 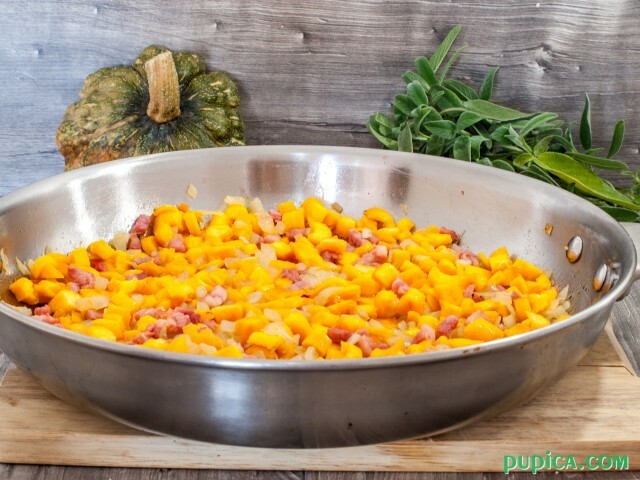 🙂 In the Pumpkin Carbonara recipe there is no need to add the cooking cream because the pumpkin sauce is already super creamy. As I bought two really small pumpkins I served the pasta directly inside them… They looked so cute and inviting! Don’t throw away the pumpkin seeds when you clean out the pumpkin. Clean and dry the seeds so you can use them in other recipes. 1Peel and dice the pumpkin. 2In a skillet warm the olive oil and add sliced onion. Cook until golden. 3Add smoked bacon and cook for a 2 -3 minutes, then add diced pumpkin and a cup of water. 4Cook for 15 minutes, stir often, add water when necessary and beat with a wooden spoon until fluffy. 6In a small bowl beat the egg yolks and the parmesan cheese. 7Take the skillet off the heat when the sauce is ready, drain the pasta and mix it with the sauce. 8Add the eggs and Parmesan mixture and toss well.